"All flights to Vietnam have to make a stop in Ho Chi Minh City. That’s what I learned on the day I flew to that city for the first time. Despite the fact that it had been renamed after that Vietnam’s great revolutionary leader since 1975, after the country triumphed over US military force in a war, the label put by Vietnam Airlines on my baggage still echoed its popular and legendary name: Saigon! 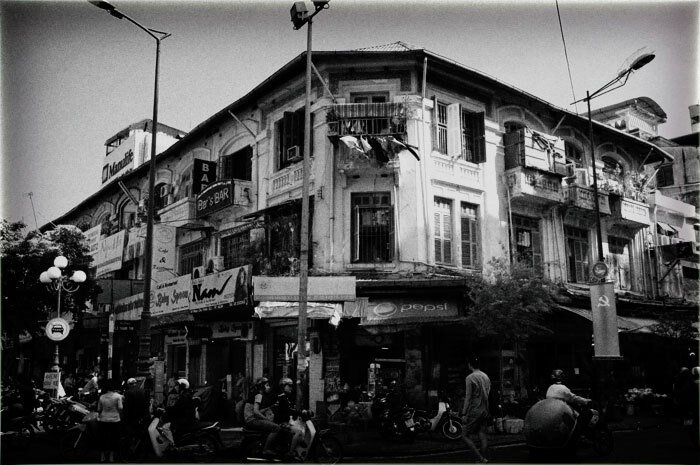 Once a major city in the French colony of Indochina, Saigon had so far preserved its colonial heritages. I could see it through the old buildings, narrow shaded streets, parks, baguettes that could be easily found even on the street, and also, faith." 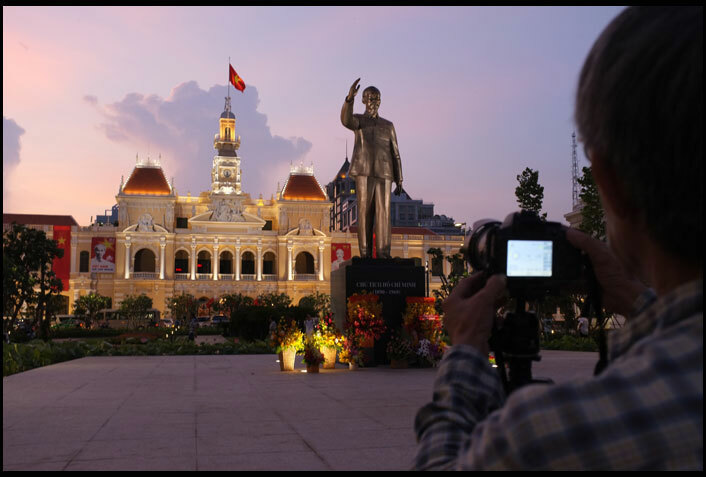 Celebrating the 125th birthday of Ho Chi Minh, a statue of that Vietnam's great leader was erected at the park right across the former city hall, attracted many tourists to capture it with cameras. The sound of six bronze bells tolled from the two towers of Notre Dame Cathedral Basilica at six in the morning to mark the time for the Lord’s Prayer. At the same time, at the square plaza right in front of the cathedral, I saw a woman get down on her knees, raised her hands, and started to whisper. Standing about 58 meters above the ground, this Notre Dame Basilica had become one of the most popular icon of Saigon. The square plaza right in front of the cathedral had become a common place for the Catholics to say their prayers. Few meters from her, a woman stood with her eyes closed and was immersed deeply in her prayers. And at the corner of the plaza, a group of women sang together like a choir. With a statue of Mary stood in the center, the plaza had been a well known place for Catholics to raise their prayers. A Catholic woman was deeply immersed in her prayers at the square plaza right in front of the cathedral. The French missionaries brought the teaching of Catholics to this land in 17th century, long before they founded its colony. It was interesting to know that despite the fact that Vietnam had become a communist country and had for centuries been dominated by Buddhists, Catholics which was brought by the French missionaries survived all social turbulences that happened after the French was forced to leave the country. 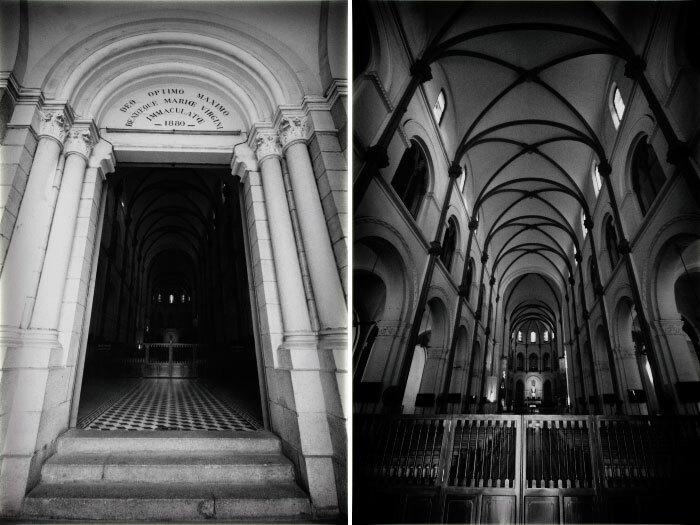 I crossed the street to see the inside of the cathedral. It turned out only prayers could go in there. So I ended up taking pictures in the porte cochere. The main entrance and the main hall of the cathedral. Nearly all materials used in this building were brought from Europe in 19th century. On the other side of the plaza, the French founded a central post office. On the first day I came to Saigon, I walked from the hotel to this magnificent building just to capture it at night. It was well illuminated and became one of favorite spots for night shot in Saigon. The central post office of Saigon. Being well illuminated at night, this building had become one favorite place for night shot. On weekdays, the building is open for public until seven at night. I was fortunate to have the change to see its interior. It was grand and magnificent. For a moment, I felt like going back in time. It was not hard to sense what it had been like to be in this post office as it was very well preserved. Despite the fact that we can now send mails within seconds and talk with our mobile phones from anywhere, people still came to this post office to post their handwritten letters, postcards, make a phone call at telephone boots, and pay the utility bills. Under the eyes of the great leader, people sent their handwritten mails, postcards, and paid the utility bills. 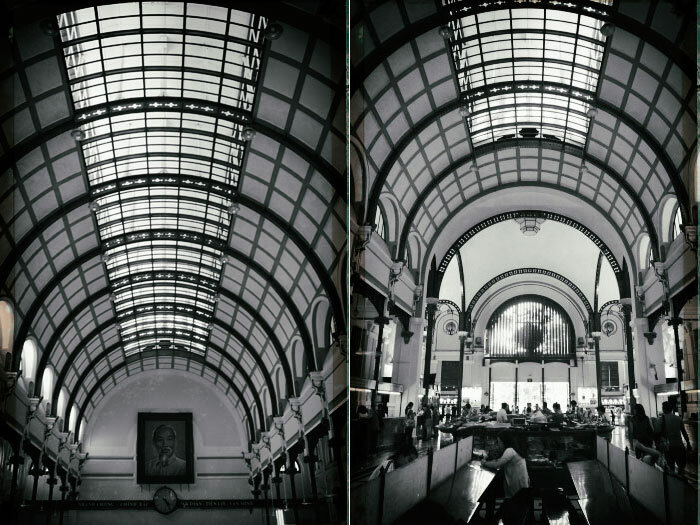 The interior of the grand post office. 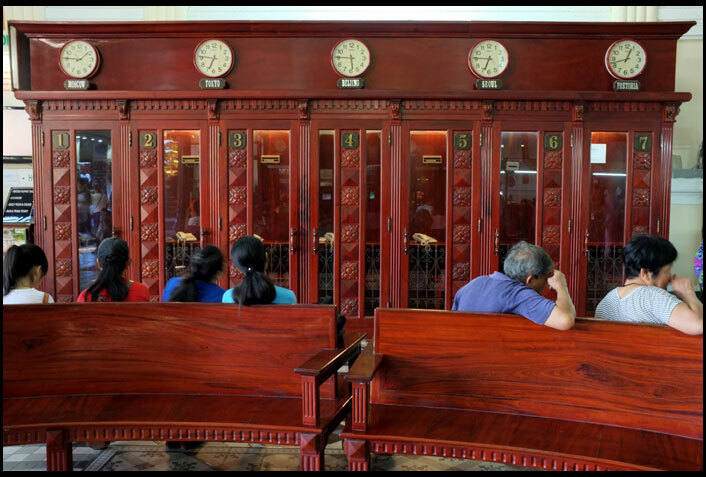 The telephone boots with clocks showing the time of big cities in the world. The main entrance and a typical window at ground floor of the central post office. Every window is adorned with two beautiful ornaments at both sides. Each ornament is engraved with a name of French scientist or inventor. If you are a big fan of Vietnam War, never miss the Reunification Palace. I was in high school when I saw a picture of Communist North Vietnam’s tank crushed and ran over the iron gate to invade the palace in 1975. Back then, it was the presidential palace of Capitalist South Vietnam, called Independent Palace. On the following days, it was renamed Reunification Palace, marking the end of the Vietnam War when the north became one with the south. 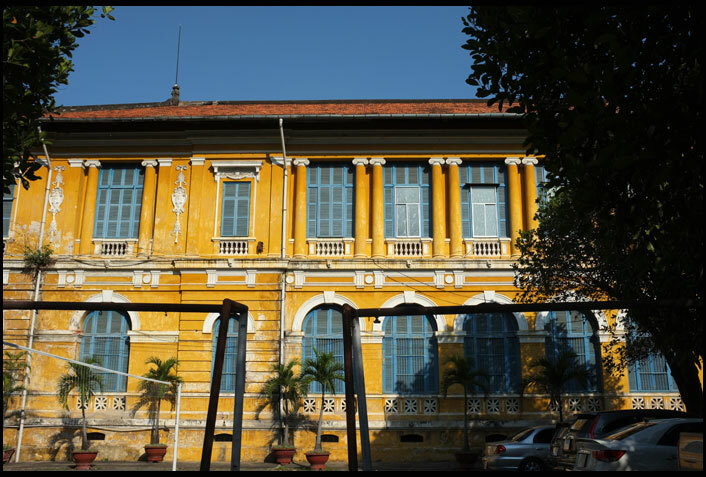 Formerly known as Independent Palace, this building was designed by Ngo Viet Thu, a local architect, to replace the French Norodom Palace which had been demolished in 1960s. I browsed around about this palace and learned that it was built right on the site of Norodom Palace, the house of the French governor general in Indochina. That beautiful palace was demolished and leveled with the ground in 1962. The only thing left was its nicely wrought iron fence. One morning, I could only capture the palace from outside as it was restricted for tourists. A beautiful park right across the Reunification Palace. 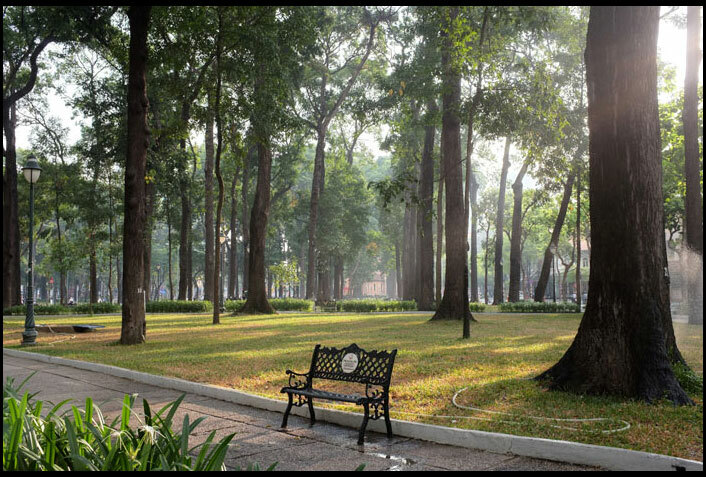 The French had built many parks in Saigon which still exist until today. Not far from the palace, there was a nice old villa which was formerly used as the French governor general’s office. The former French Governor General's office, located at the same complex with the palace. Few days before my coming to Vietnam, I had browsed around about some places that might be nice for night shots. First, it was the city hall. Most pictures of this building I had seen was taken from the park right across it with the statue of Uncle Ho Chi Minh as the foreground. It was sad that the first night I came there, the park was closed due to the renovation. I had to find another point to capture the building. Fortunately, when I returned to that park on the other night, it was re-opened for public. It was nineteenth of May, right on the birthday of Uncle Ho Chi Minh. I saw that a new statue of the great leader was erected in the park. Many flowers were put in front of it as to celebrate his birthday. Well, I guessed no matter how long he had gone, he was still alive in every Vietnamese’s heart. The former city hall of Saigon taken from the park right across the street. A new statue of Ho Chi Minh in standing position was erected to commemorate his 125th birthday. Not far from the city hall, the French colonial government built an opera house, also known as Municipal Theatre. The opera house looked great that night. It was nicely illuminated. I tried to capture it from across the street. And, oh, the traffic was amazingly busy and very chaotic. I could hear the sound of klaxons nearly every second. The Municipal Theater. 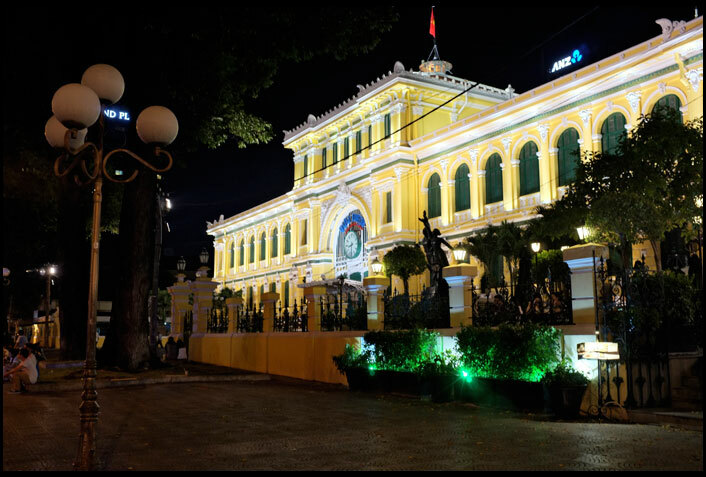 Located not far from the former city hall, this building was one of the most vibrant place in Saigon at night. The idea of being in a communist country seemed to blur away when I walked around the opera house. Many young people hanged out with their friends, playing with their new gadgets, some of them would have rather sit in the café on the street side, and they all seemed to have freedom to express themselves. At one corner, I found a boot where people could get free wifi. And believe it or not, there was no such thing as tight censorship in accessing any websites that they wanted to see. Well, I wondered how uncle Ho Chi Minh would have reacted if he had seen that phenomenon. The Saigon Supreme People's Court taken from its rear side. 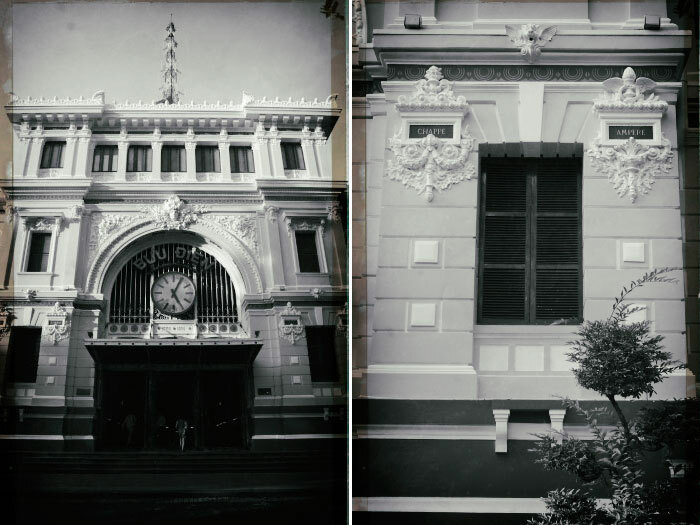 Next to the opera house, there was Hotel Continental Saigon, an old building inaugurated in 1880 by the French. Even though I had only seen Paris in pictures, I could sense the taste of French while staring at this place. The scale, proportion, and rhythm of the architecture were able to make us feel like being in Paris. Somehow, I thanked God that despite all the conflicts and wars that happened in Vietnam, these beautiful old heritages remained magnificent. On my last night in Saigon, I realized that there was another nice place for night shots. It was Ben Thanh Market. That traditional market had not been on my list before. I had no clue from where I should take its pictures, so I had to move some times to find the best angle I could think of, and that made me cross the street. It was challenging to reach the circle park right across the market. The traffic was insanely busy, and there was no proper crossing for pedestrians. The main entrance to Ben Thanh Market taken from the circle plaza right across the street. The market was open in the early 20th century by French colonial government to replace the old traditional that had already existed near the Saigon river. While I was on the way to the airport on my last day in Saigon, I saw people gather in many city parks the French had built. They jogged, danced with music, and some of them just spent that morning reading books, having breakfast with a baguette in their hands, or feeding the pigeons. I couldn’t help but thinking that may be the French people today did the same thing in their country. Well, the French might have long gone from Saigon. But I was pretty sure that their spirit and soul remained in this vibrant city. Lihat foto-foto ini jadi kangen ke Vietnam deh. Reunification palace sekarang ditutup buat turis? wah, berarti gue beruntung bisa masuk waktu kesana tahun 2010. Hah? serius lo bisa masuk??? Gue ga tau pasti sih itu tertutup atau nggak, Soalnya pas kita nyari2 loket or sejenisnya, kita ga nemu. Iya, gue bisa masuk. Fotonya sempat gue posting di multiply. Waktu itu gue ikutan paket city tour. Jadi nggak ngebolang sendiri. Tapi seinget gue ada loketnya kok di gerbang depan, dekat penjaga. Karena waktu itu mobil kita sempat berhenti dan dihitung ada berapa orang yang akan beli tiket. Mmm... semoga next time bisa liat dalemnya.